As miserable and agonizing a recording as has ever been released by a functioning record label, Led Zeppelin‘s “Tea for One” has been actively misunderstood since Presence‘s release in March 1976. The song has found fewer advocates than most due, largely, to the extent to which it succeeds in conveying emotion. Even life-long Led Zeppelin devotee and Tight But Loose founder Dave Lewis has maintained a lukewarm stance toward the song over the past forty years, referring to it as “relaxing but unspectacular”1 in the same way, presumably, that Taxi Driver is relaxing and unspectacular because it features fewer cuts and hand-to-hand combat scenes than a Jason Bourne film. Not a pleasant exercise by any stretch, “Tea for One” serves as an admission of Robert Plant’s despondence over his isolation from his family on tour and the 1975 car accident that had compromised every aspect of his life. Weary and not yet assured of his complete recovery from his injuries, Plant certainly cannot be faulted for accurately conveying these sentiments in his vocals. Perhaps more remarkable is the fact that Page’s main solo, his longest on a Led Zeppelin studio recording, retains as tight and memorable a structure as that of any other solo in his (or anyone else’s) catalogue. Though it should have been apparent to listeners by 1976 that not a single note was ever wasted on a Jimmy Page-produced record, Page matches all of his previous efforts with this display, employing slight reverb and tone shifts to great effect and truly composing. Introduced by two flurries worthy of their own write-up, the solo elicits some of Page’s most lyrical, rending lines, which in turn offer both startling moments and a cumulative sense of emotional outpouring that rivals that of “Achilles Last Stand”. Furthermore, Page avoids anything verging on flash or histrionics, yet the performance remains as compelling and technically daunting as “Since I’ve Been Loving You”, “I Can’t Quit You Baby”, or “I’m Gonna Crawl”; it is worth keeping in mind, as well, that Page recorded every overdub and solo for Presence within 48 hours. With a final flourish that, appropriately, proves more woeful and resigned than triumphant, the band finishes the song and the ordeals of 1975 in its sorriest state. The greatest obstacle to “Tea for One” has been the song’s consistent dismissal as a “faded photocopy” of “Since I’ve Been Loving You”. Page’s decision to include phrases from “Tea for One” in the post-1975 live renditions of “Since I’ve Been Loving You” did nothing to dissuade reviewers from this attitude, yet this ultimately proves only that the songs share the same key, as the guitar solos discernibly change tone whenever Page works in the Presence cut. 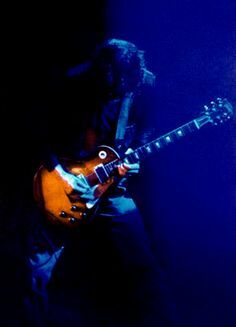 In fact, Page would further gravitate toward this approach, extending the solo section for “Since I’ve Been Loving You” in 1979 and 1980, performing “Tea for One” in its entirety as “Page and Plant”, and playing “Tea for One”-rooted leads for the 2007 O2 reunion performance of “Since”. The songs bear similar structure and blues influence, but the distinct chord sequences, riffs, and arrangements do more than enough to ensure that no one could possibly confuse the two. Nevertheless, Lewis declares the track a “respray job” of “Since” that never “recaptures [its] excitement”2 and, as a victory lap, assesses that “[Page’s] solo is adequately applied in the expected tradition”3. Even without Plant’s lyrics, the vocalist’s aggrieved, withered calls and Page’s comparatively understated but grueling guitar place the song in its own realm musically and emotionally. If “Since I’ve Been Loving You” is seven-and-a-half minutes of pleading and agony, “Tea for One” is nine-and-a-half minutes of nonexistence and hopelessness. Obviously, it is not unreasonable to think that the average pop listener would not voluntarily submit to unfettered pain for such a period of time, but the whole premise of rock and, even more so, Led Zeppelin revolves around emotional involvement. The listener’s unwillingness to feel cannot be held against the quality of a given recording. Few would claim “No Quarter” fails as a song because it lacks enough levity; similarly, Barber’s “Adagio for Strings” is probably not so affecting as to become “unmusical”. Rolling Stone, more recently, featured the song in a cheerful segment entitled “22 Terrible Song by Great Artists“, in which the song found itself placed alongside “My Ding-a-Ling”. The reviewer(s), however, exceeds any allowance for subjectivity by contending that “Page’s playing here does indeed have the quality of an afterthought” and Plant’s “wan moan sure ain’t the work of a guy who’s recently ingested anything caffeinated”. Decidedly more moronic than the claims that “I Can’t Quit You Baby” is “boring” because it requires attention across its five-to-six-minute running time or that “Ramble On” loses all musical credibility because Plant utters the word “Gollum” or that Led Zeppelin III betrayed the souls of millions to destitution by including a few more acoustic guitars, this comment goes a step further by attempting to find technical fault as justification for its own disregard for the band’s purpose. This, however, coming forty years late, constitutes a manageable criticism and, if anything, shows improvement in Rolling Stone‘s musical taste in the fact that someone on the staff was vaguely familiar with the song and felt Led Zeppelin was made up of at least one artist. Elsewhere, the reliable Stephen Davis accused Plant and Page of being “dreary” in their attempt to convey loneliness, homesickness, and misery in his allegedly-positive* review of Presence for the magazine in 1976. More disturbing is Andrew Doscas’ review of the deluxe edition of Presence for PopMatters, in which the writer asserts that “Tea for One” “is a failure of a ballad” that “may very well be the worst Led Zeppelin song of all time”. The fatal misstep in his indictment, it could be argued, is that he feels “Tea for One” represents a ballad in the same tradition as “the sensitive ‘The Rain Song’ [and] the timeless ‘Ten Years Gone'” and should be judged accordingly. He of course proceeds to state that “all four members sound incredibly bored on the recording”, a belief that Plant may not share. Incidentally, Doscas had prefaced his article by acknowledging that previous notices criticized Presence for “what it’s not, instead of what it accomplishes”. After all that, “Tea for One“‘s abysmal, now widely-touted reception raises suspicions as to how the reviewing party could have understood the seven discs of material that preceded Presence or any of Page’s musical ventures on stage or in the studio, given that the guitarist has always been more concerned with affecting than impressing. This tendency, as it happens, has only made his efforts far more impressive. *Davis refers to Presence as his “favorite Led Zeppelin album”4 and promises that the group “never made a better record”5 in his LZ-’75 tour journal. He even reprints the 1976 review in its entirety, yet neglects to account for such statements as “Give an Englishman 50,000 watts, a chartered jet, a little cocaine and some groupies and he thinks he’s a god. It’s getting to be an old story”, “Presence takes up where Physical Graffiti left off–few melodies, a pre-occupation with hard rock rhythm,…and a general lyrical slant toward the cosmos”, “emotions conflict and the results are mixed”, “a few bars…place [the listener] in a nightmarish 1970 movie about deranged hippies” (he regrettably does not specify the song or film in question), and, ultimately, “Zeppelin’s main concern here is to establish a reliable riff and stick to it, without complicating things too much with melody or nuance”. He does, to his credit, concede that “actually, there is some fine rock on Presence“. Lewis, Dave. The Final Acclaim, 61. Lewis, Dave. Led Zeppelin: A Celebration, 58. Absolute great blues track . Thought it was excellent in 1976 and nothing has changed . So many big names since ‘ blues revival ‘ but tell me who else crafts and produces songs like this !